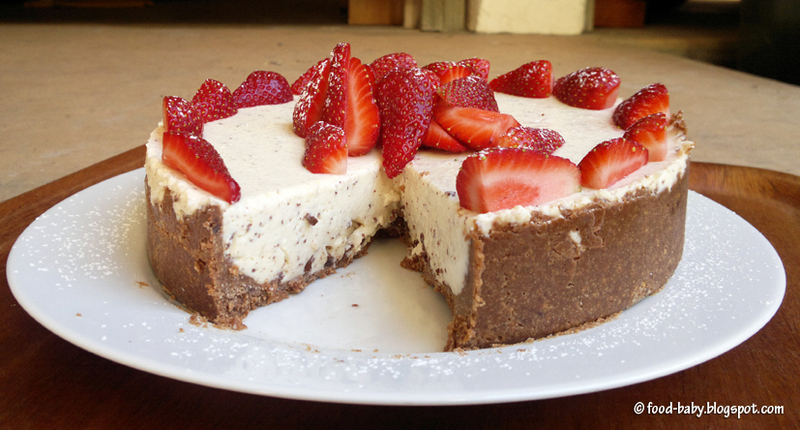 I've made a lot of cheesecakes over the years like these here, here and here. 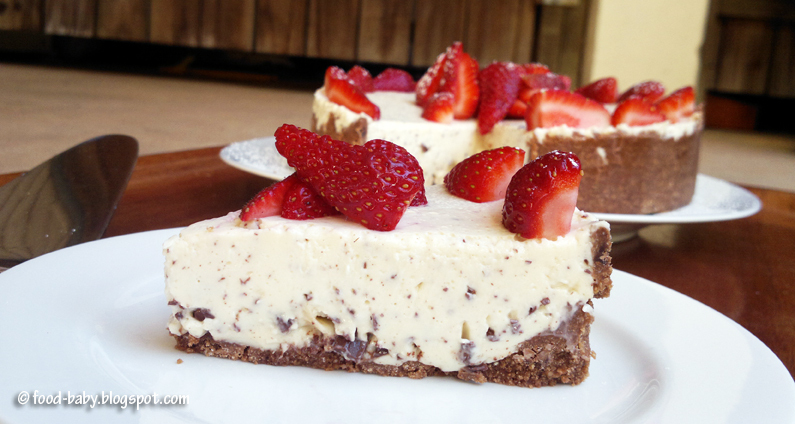 But I can't even remember the last time I made a no-bake one! So in honour of my dad coming to dinner I decided to make this no-bake Chocolate Chip Cheesecake. Wow, seriously good! The filling is smooth and light and the natural yoghurt gives it a lovely tangy creaminess. I actually chopped the chocolate rather than grated it so I had a few bigger chunks of chocolate that sank to the bottom. Not that there's anything wrong with that! Served with fresh strawberries this was the perfect make-ahead dessert and a great alternative when you don't have time for a baked cheesecake. Two thumbs up!!! Line the base of an 8 inch springform pan with baking paper and set aside. Using a food processor, crush the biscuits into a fine crumb. Add the melted butter and blitz until well combined. Pour the crumbs into the prepare tin and smooth over the base and about halfway up the sides. Place in the fridge to set. Sprinkle the gelatine over the hot water and set aside for a few minutes then stir to make sure it is completely disolved. Wipe out the food processor bowl then add the cream cheese and whiz until smooth. Add the condensed milk, yoghurt and vanilla and mix well. Add the cooled gelatine mixture and whiz for 1 minute until thoroughly combined. Tip in the grated chocolate and blitz to mix through. Pour over the prepared base then refrigerate until set, a few hours at least or overnight. 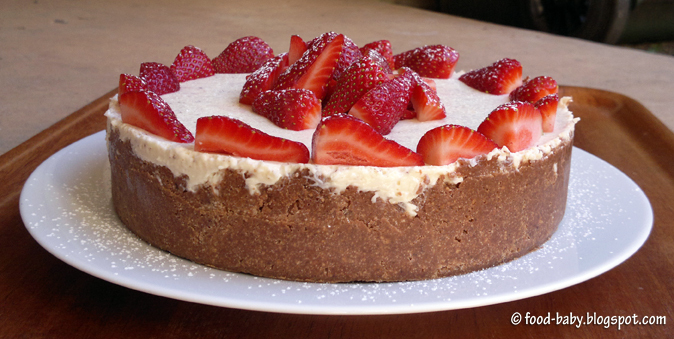 Serve with sliced strawberries and a dusting of icing sugar. Serves 8-10. Beautiful pics! I actually like irregular chocolate chunks better than chips. And I love a cheesecake with condensed milk! Looks absolutely delicious! I love a good cheesecake and this looks awesome. A real winner with the French chocoholic hubby. Thank you for sharing.